In today’s business world, business organizations experience unprecedented levels of disruption and can only expect the unexpected! While they must perform in a VUCA world (one characterized by volatility, uncertainty, complexity, and ambiguity), their ability to OODA (observe, orient, decide, and act) is no longer enough to survive and thrive amidst disorder! While agility is quintessential for adapting in this new reality, antifragility is quintessential for evolving in this new reality! Conclusively, business organizations must embrace this new reality and emerge stronger! In The Antifragility Edge: Antifragility in Practice, Si Alhir demystifies antifragility, explores how antifragility may be operationalized or put into practice by business organizations (at the individual, collective, and enterprise level), and offers an actionable roadmap for how business organizations can achieve greater antifragility. An essential guide for businessorganizations to embrace disorder and emerge stronger. ●The author explains that for organizations to embrace this new reality of disorder and emerge stronger, they must embody an antifragility edge. 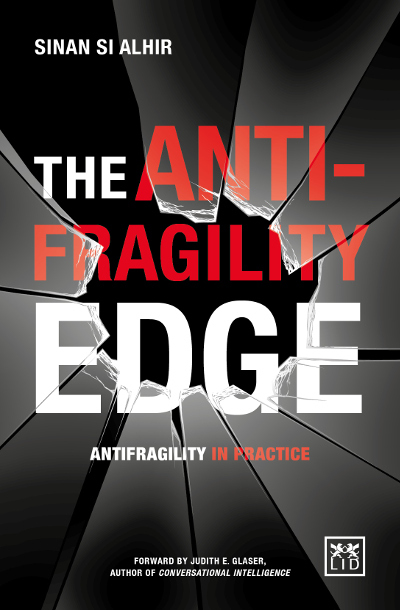 ● Explores how antifragility may be operationalized by organizations and offers actionable roadmaps for how organizations can achieve greater antifragility. ● Readers will appreciate the practical ideas they can begin using immediately to embrace reality and emerge stronger!